ePSP bubble installer (by CelesteBlue) is a program that allows you to install an ePSP bubble to install ARK/Adrenaline. Version 2 introduced a way to activate your PSVita as well via the Settings app. Notes for this version: Adds a way to activate your PSVita as well via the Settings app. 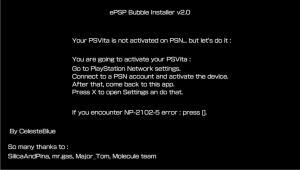 Find download links for ePSP Bubble Installer below.